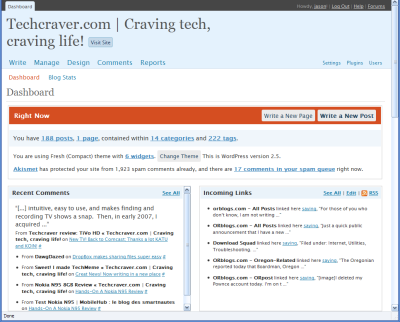 WordPress, the open source blog management software, has released version 2.5 of their popular web application. WordPress has been quickly adopted because it presents a very flexible and easy to manage web publishing system. Out of the box it is a fully functional blog management system, but can also be used as a content management system (CMS) for a website as well. WordPress.org focused 2.5 on implementing a much-needed facelift and adding functionality to the administrative interface. The dashboard has been un-cluttered considerably, creating a welcoming environment when you first log in to your blog’s back-end. Also, administrators can now install dashboard widgets that show items such as stats about your posts, comments, incoming links, popular news, and so on. Some of the widgets feature RSS feeds for easy tracking in your favourite RSS reader. Features presented inside the blog post editing screen include multi-file uploading that includes a progress bar. This means no more having to upload files one at a time, providing a huge time-saver. Also, if your jpg images have EXIF data you’d like to show, WordPress will automatically extract that data into fields you can use. If you have a blog that has multiple authors, the WordPress folks have addressed a major issue: concurrent editing protection. Now in version 2.5, if you edit a post that someone else has open as well, you’ll be prompted. No more auto-saves overwriting each others edits. WordPress will automatically lock the post and prevent concurrent saving. If you’ve used WordPress’ new multi-file upload feature and have uploaded a batch of photos, you’ll enjoy the new built-in gallery as well. There is new short code for displaying galleries with thumbnails and captions. Users can also leave comments on individual photos. WordPress.org has documentation outlining the syntax for using this new functionality. Safari uses will enjoy the new post editor as WordPress 2.5 includes Tiny MCE version 3.0 which boasts improved compatibility with Apple’s Safari browser. Finally, WordPress search now indexes web pages, in addition to blog posts. This much needed feature adds to WordPress functionality as a CMS for a small website. WordPress 2.5 has some much needed features and has advanced its functionality for anyone who wants to publish their own blog or website. To get started, make sure your hosting environment features PHP and MySQL (these components power WordPress) and download WordPress. Their 5-minute installation set is also available. Alternatively, if you’re upgrading from a previous WordPress version, check out the upgrade instructions or use the WordPress Automatic Upgrade plug-in. I always turn off the Visual editor on WP setups. It always proves trouble with new clients. The HTML tab should be the default. FYI – Update to WP 2.8.4, lots of security fixes. Thanks for the suggestion. I have tried this in both Safari and Firefox several times over the past week and still no luck… I just tried this with today’s Safari upgrade, too. This issue has been written up all over the web, but there does not seem to be any clear response from the (normally excellent) WordPress team. This is especially frustrating since the type of functionality in the Visual Editor is not especially complex. It is available in many other web applications. This is a major bug and a show stopper for me and many others. Hope the WP developers are able to quash it soon. Mistergreenjeans, the issue you describe is known. You need to clear your cache and restart your browser and you’ll get the link and image buttons back. WordPress.com (I mistakenly typed .org) in my comment above, is still broken on Mac OS X. The link and image buttons in the visual editor do not function. I wonder how long it will take for the WP team to quash this major bug? thanks for letting me know – I fixed the links. Hi, just a note: all the links use the wwd base, they’re not right.